Exclusive Hotel Spinale is located in a quiet part of the famous resort of Madonna di Campiglio at Monte Spinale cable car. Town center only about 100m from the hotel. Traditional, recently renovated hotel Carlo Magno Spa Resort is situated at an altitude of 1.700mv the Campo Carlo Magno Madonna di Campiglio about 2km from the town center, where shuttle service is free. Completely renovated Sporthotel Romantic Plaza is located in the center of the square, one of Madonna di Campiglio in the lifts and slopes. The apartments are located in various private homes in the area of Campo Carlo Magno and Madonna di Campiglio. From the center located about 100 to 1500 meters. The completely renovated hotel Cerano Relax has a great location in the resort of Madonna di Campiglio Spinale cable car in just a couple of meters into the center of the pedestrian promenade, shops and restaurants. Design Oberloser Hotel is conveniently located on the outskirts of the center of Madonna di Campiglio in the Spinale cable car, a few minutes walk from the center of the pedestrian zone. Hotel Chalet del Sogno is located on the edge of a ski slope in vychytenej Italian resort of Madonna di Campiglio. Center with shops and restaurants about 250 meters, a pleasant walk. St traditional Alpine hotel. Raphael in Madonna di Camiglio is far from the center with restaurants and bars 100m. Elegant Alpen Suite Hotel is located in the heart of Madonna di Campiglio resort, only 400 m from Piazza right. Hotel Italo is conveniently located in Madonna di Campiglio, city center 300m. Distance to Lifts: Lifts Spinale 250 m, ski bus stop 20 meters from the hotel. Hotel Golf has a long tradition in an excellent location in the middle of mountain scenery in the resort of Madonna di Campiglio in the Campo Carlo Magno, about 1.5 km from the center. To / from the shuttle service - hotel shuttle bus. 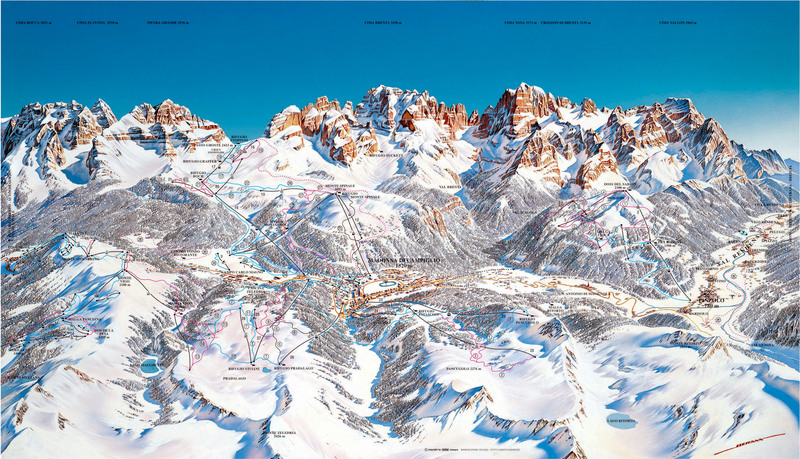 Catturani Residence is located in Campo Carlo Magno about 1.8 km from Madonna di Campiglio, which attracts local bus. Stores are located in the vicinity. Club Hotel Relais des Alpes is located in the center of the resort of Madonna di Campiglio, at an altitude of 1,550 m.
The recently opened hotel Cristal Palace is located near the center (about 500) of the popular resort of Madonna di Campiglio. To the center runs a shuttle service, hotel shuttle bus. Residence Ambiez located in the heart of the Brenta Dolomites, it is an ideal place for lovers of skiing and snowboarding in an impressive ski area of Madonna di Campiglio, Marilleva - Folgaria at an altitude of 1,500 m above sea level. Renovated hotel Gianna is situated on a quiet place, 600m from the Madonna di Campiglio, in the Adamello Brenta National Park, at an altitude of 1,550 m.
Residence Rio Falzé is located in the Campo Carlo Magno about 3km from the center of Madonna di Campiglio. Connection to the center is provided free shuttle bus at designated times. Supermarket about 1km. Hotel Canada is located in the center of Pinzolo, 150m from the shops, restaurants and bars. Madonna di Campiglio, 12 km, 60 km railway station Trento, Verona airport 160km. The family-run Hotel Chalet Fiocco di Neve is situated in a quiet location, about 400m from the center of Pinzolo with shopping, restaurants and bars. New Residence Beverly has a sunny location in a quiet part of town Pinzolo, 500m from the center. Altitude resort 800m. Small cozy guesthouse Garni Binelli a convenient location for skiing in economically interesting prices. Hotel Garni Binelli is situated in a quiet location but only about 100m from the center of Pinzolo, shops and restaurants. Garni has a total of only 16 rooms. is one of the finest experiences any recreational skier. The Brenta Dolomites come into their own young, old, beginners and experts skiing, thanks to a network of blue slopes and families with children. If prosper weather and the sun-drenched slopes appears recently under snow from the night before, the experience is an astoundingly friendly. 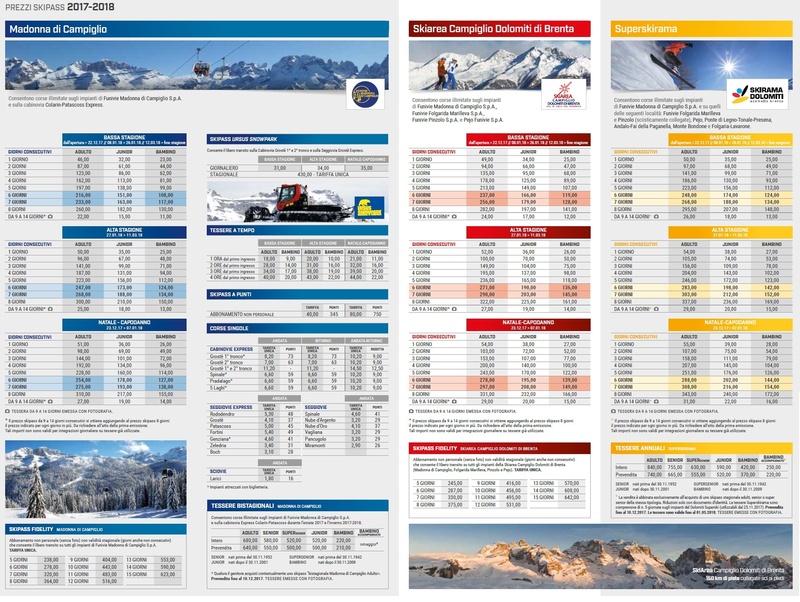 Thanks concentrated on the common skipass Skirama Dolomiti ski resort of Madonna di Campiglio accessible and less demanding clients accommodation in nearby cheaper destinations in Val di Sole.